Imagine racing off to Spain to experience the last round of the Motorcycle Grand Prix season LIVE! Thanks to Swann, one lucky rider will win an all expenses trip for them and a mate to the 2018 Valencia Motorcycle Grand Prix. Grab a Motorcycle Insurance quote from Swann by the 9th of July 2018 to be in the running to win. If you already ride with Swann, we’ll be in touch via email about how to enter. This full-speed fiesta valued at over $17,000 includes a 3-day pass, plus flights, accommodation and spending money. Call 13 RIDE (13 7433) or click here to get a quote. Disclaimer: INSURANCE AUSTRALIA LIMITED ABN 11 000 016 722 AFS Licence No. 227681 trading as Swann Insurance (Swann), of 388 George St, Sydney, NSW 2000. Promotion Starts: 13/4/18 at 9am AEST. Ends: 8/7/18 at 11:59 pm AEST, for those aged 18 years or over and is an Australian resident. Entry limit 1/person. Draw: 2:30 pm AEST 16/7/18, L2/35 Little Bourke St, Melbourne VIC 3000. 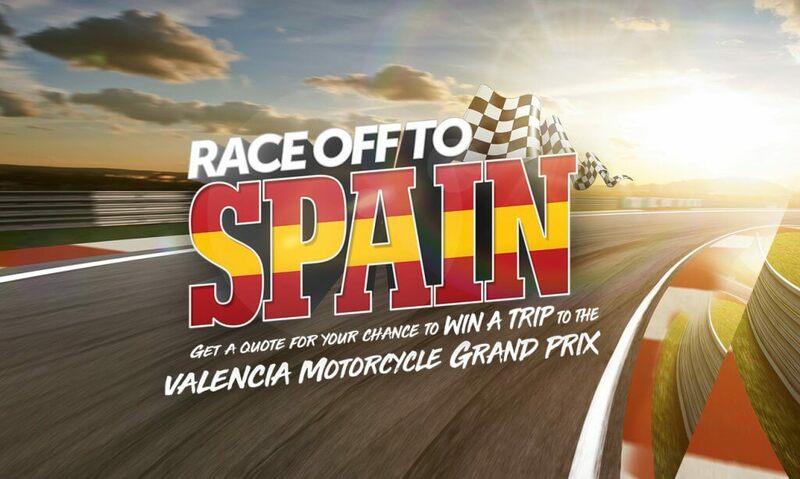 Prize: trip for 2 adults to Valencia Motorcycle Grand Prix, 16-18 Nov 2018 (valued at up to AUD$17,800) consisting of return airfares, accommodation, transfers and spending money. Winner published at www.swanninsurance.com.au by 20/7/18. Click here for full Terms and Conditions. ACT Permit No. TP 18/00615, NSW Permit No. LTPS/18/23391 and SA Permit No. T18/544.